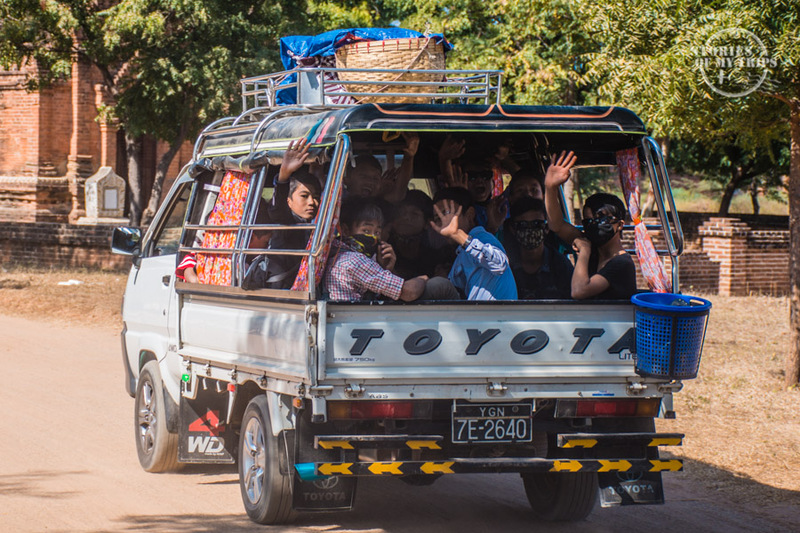 We had many questions before arriving in Myanmar about the transportation in the country. However we didn’t have any problems and were surprised by the good quality of the buses and how punctual they were. The routes can be long, so you have to plan very well and try to use the night buses to save time and money. The night busses are very comfortable and it is very easy to sleep in them. We arrived at the Yangon airport and, as we read on Wikitravel, we went to look for bus 51 that would take us to the center of the city. The bus stop was about 20 mins walking from the airport and we found it easily. The difficult thing was to identify the bus, since they use Burmese numbers and we were not prepared for that. We asked around and people helped us to take another bus that would also take us to the center. We never knew the number of the bus, but it did take us to the center. We then walked a few blocks to the hotel that was in the Chinatown, in the middle of the traffic chaos, but that was also very interesting. We spent 2 nights in this lively city, we took public buses to go everywhere, we also took the circular train and had fun getting to know Burmese people. We bought the bus ticket to Kalaw in our hotel. We took a VIP night bus which means 3 seats per row (2 + 1) and it left around 7pm. The bus was very comfortable and we got blankets and snacks. You need to take an extra coat because the night buses are very cold. We arrived at 4am in Kalaw after a few bathroom stops (no toilet on the buses), and also for dinner. We went that early to the hotel we had booked, and they were waiting for us to give us a temporary room to rest until check-in time. One night in Kalaw was enough to see this beautiful town, its fun market and to make the reservation for the tour to Inle Lake. This is a 3-day 60km walk, where we went through beautiful landscapes and saw how the locals live. The tour included a boat that would eventually take us across the Inle Lake to the town of Nyaung Shwe, this town is where people visiting Lake Inle usually stays. We stayed here for 2 days and rented bikes to go around the lake and the vineyard. After asking in many agencies, we chose an ordinary night bus (not VIP) to go to Bagan. The difference with the VIP bus was huge! Even though we were promised blankets, as soon as we got on the bus we realized that it was not true and we were freezing all night. The bus to Bagan also departed around 7pm and arrived at 4am. The bus station is out of the city so you have to negotiate (a lot) with taxis for the short trip, where you also go through the entrance control to the city of Bagan and you have to pay the entrance, about $20 per person. 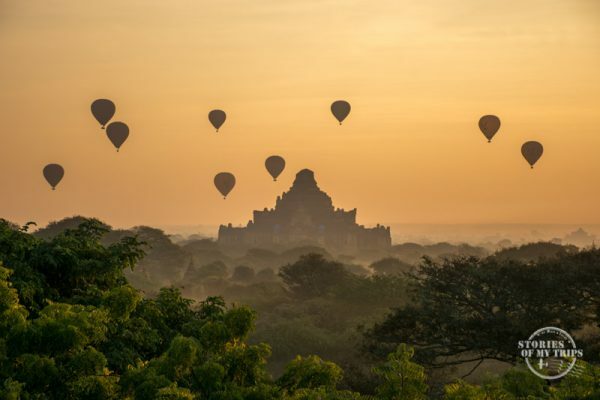 In Bagan we spent 3 beautiful days! Every day we rented an electric motorbike and went to see the sunrise in a different temple and then also the sunset. Sunrises and sunsets are simply magical. We bought our ticket to Mandalay at the hotel where we stayed, and the pick up was included. It was time to head north to Mandalay, the former capital of the country. So we took a mini bus and it took about 7 hours going through beautiful landscapes. We arrived at the south station of the city and a tuk-tuk that was included in the price of the bus dropped us off at the hotel we had booked. We didn’t like Mandalay itself, but there are many places around the city much more interesting. We went to a town on the other side of the river called Mingun, where there is a beautiful white pagoda, the world’s largest big construction and the world’s largest uncracked bell. To get there we went to the port on Strand Road to take theonly boat that leaves at 9am and returns at 12:30 pm. It might seem short, but it was enough time to visit Mingun. We found a truck driver willing to take us to the U-Bein Bridge for a very reasonable price for 4 people, and enjoyed the sunset on the longest wooden bridge in the world in the south of the city. We got our bus tickets to Hsipaw at our hotel in Mandalay, but we later learned that we were charged twice the price than if we had bought them directly at the bus station (of course!). It was a long trip and we arrived at night. The road is in the mountains and it is very beautiful. You can see in the distance the Gokteik Viaduct, which is supposed to be the 2nd highest in the world. The scenery in Hsipaw is drier and mountainous. It is very interesting to walk around and go trekking. It is not very popular with tourists and you can interact with locals and enjoy their endless smiles. 3 nights were enough to recharge energy in this quiet town. 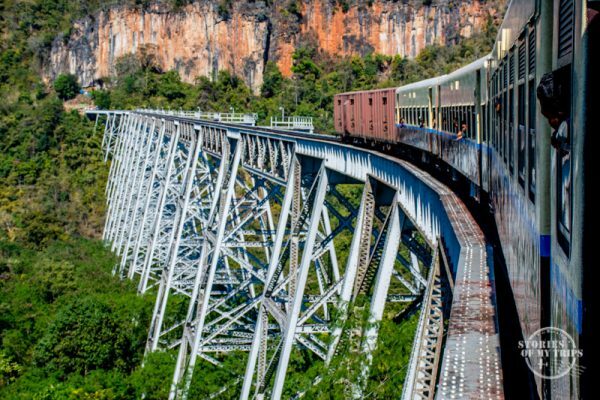 We took the famous train in the morning, which crossed the Gokteik Viaduct and enjoyed beautiful views. The ticket for the train must be purchased the same day of the trip because the office is only open at that time. It is better to go early to choose a seat on the right side of the train, which is where you have the best view if you go in this direction. The journey is long and we arrived in the afternoon to the city of Pyin Oo Lwin. This English-like city offers more than one could think. We biked around the many mansions in English colonial style. We felt in Europe for a moment as we went through woods and sports clubs with English names. After two nights where we stayed in an old colonial mansion converted into a hostel, we took a night bus to Yangon and the same morning we took the plane to the capital of Laos: Vientiane. Myanmar remains in the top of our favorite countries in Asia. Nowhere else we felt a place as authentic as this one. The most special thing about this place is the people and their nobility and simplicity. If the visa were longer we would have loved to stay longer, but for sure someday we will return. We will be telling you more details about our trip in this country and the reasons why it is our favorite. If you have any question about traveling around Myanmar, leave it in the comments. 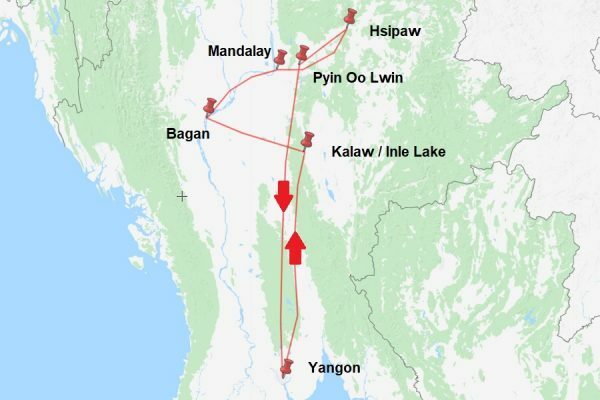 Posted in Myanmar, Preparation, Routes, Transportation.